This well-known myth from Ancient Greece is told, for the first time, as a lively modern rhyme for children. 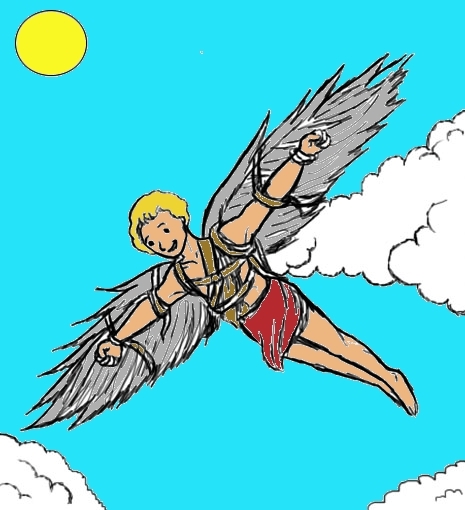 The story is centered on Daedalus, an inventor - a man so clever that he can build things that defy the laws of physics; and his son, Icarus, a boy who learns the hard way that children should listen to their parents. Does it matter that we now know that flying "too near to the sun" does not actually make sense? You decide. This poem was written in 2014 by Paul Perro. We hope you enjoy it. Please note that it is not suitable for very young children. With young Icarus, his son. The pair went on the run. Their home, where they'd be free. The boats were all the king's. Two giant pairs of wings. The wings were quite a sight. And soon they were in flight. "Fly straight ahead young Icarus"
The boy heard his dad say. The wings soon fell apart. It broke his father’s heart.